While growing up in Parsippany, N.J., Stephen V. Avallone, M.D., UHealth’s new director of executive health and concierge medicine, dreamed of becoming a physician. But as an 18-year-old heading off to the U.S. Coast Guard Academy in New London, Conn., he had to put his plans for a medical career aside because the institution didn’t offer a pre-med track. Instead, he chose civil engineering, a profession in which he later earned a graduate degree and worked for more than a decade. From left, Stephen V. Avallone, M.D., with Cristina I. Pravia, M.D. 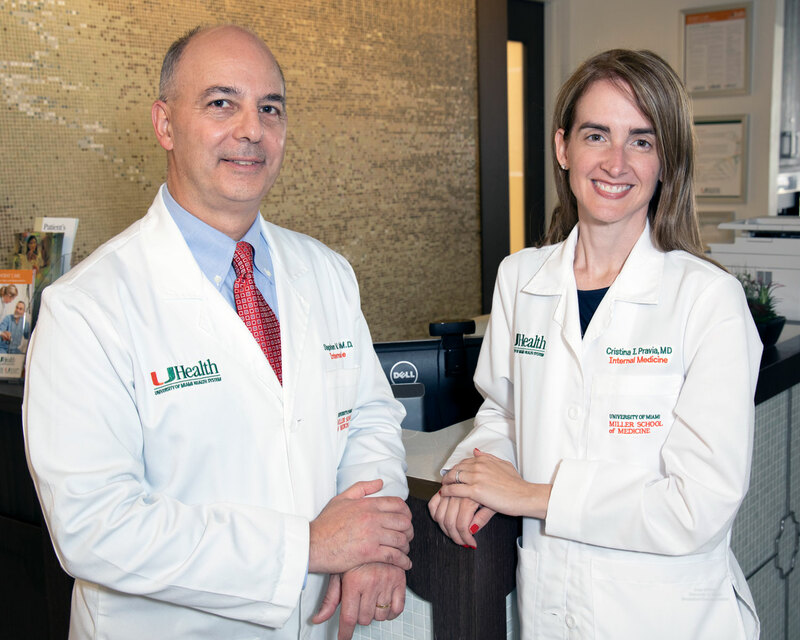 Still, when a move to Miami offered him the opportunity to pursue his original goal at the University of Miami Miller School of Medicine, he didn’t hesitate. After graduating in 2000, Dr. Avallone completed his internal medicine residency training at Cleveland Clinic Florida. He began his executive health practice there in 2003, becoming the medical director of its Huizenga Executive Health Department in 2010, a position he held until joining UHealth in July. Cristina I. Pravia, M.D., a long-time colleague at Cleveland Clinic Florida, joined Dr. Avallone as UHealth’s associate director of executive health and concierge medicine. One of his Miller School classmates in 2000, she completed her internal medicine residency at UM/Jackson Memorial Hospital. She joined Cleveland Clinic in 2003, where she built a robust internal medicine practice and joined the executive health department in 2010. A native of Puerto Rico whose family moved to Miami in 1987, Dr. Pravia is the holder of four degrees from the University of Miami and is proud to be “back home” on a professional basis. Executive health and concierge medicine are two different models of care. Executive health involves a single visit of several hours with a set fee. The UHealth executive program consists of a thorough physical examination, blood work, cardiovascular screening and pulmonary evaluation, and consultations with a nutritionist and an exercise physiologist. There usually is not a continuity of care component unless something is uncovered that requires follow-up consultation or treatment. By contrast, concierge medicine is a membership model in which patients pay an annual fee not only for an annual expansive physical exam, but also for 24/7 phone and email support toward patient health education and annual exam health goals. The smaller concierge practice panel and substantial electronic communication connection translates into easier scheduling of appointments — typically an hour, since plan reimbursement requirements are not restricting appointment length and annual exam goal coaching is included — with their physician. The two programs are not necessarily mutually exclusive; an executive physical patient may choose to become a concierge medicine member for ongoing health care needs. “A physician in a typical practice might have 2,000 to 3,000 patients; a concierge practice physician might have 300 to 600 patients. This smaller and more connected practice model builds stronger doctor-patient relationships, providing health care in a more efficient, effective manner. You promote wellness and prevent disease, rather than trying to catch up with disease once it has developed,” Dr. Avallone said. Both physicians find these personalized forms of medical practice extremely satisfying.